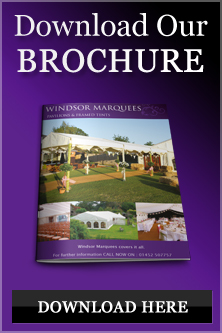 Windsor Marquees offers the highest standards in marquee hire in Worcestershire , priding ourselves on personal service, care and attention to detail. We will make your event perfect and successful whatever the size. We specialise in marquees and accessories hire and with our dedicated staff are here, ensuring you can relax and enjoy your day, whatever the occasion within Worcestershire and its surroundings. Worcestershire covers an area of approximately 738sq miles. It includes the Malvern Hills which has been described as a mountain range in miniature, the eight mile ridge containing some of the oldest rocks in Britain, their craggy outline giving the impression of uplands further west. They were good enough for Mallory to come and walk in preparation for Everest whilst staying with colleagues at Malvern College. Today you can enjoy over 4500 acres of open countryside climbing to the highest point at Worcestershire Beacon or enjoying the quiet ramblings along the wooded slopes. Just below the Malvern Hills lies the Three Counties Show Ground which holds many major events throughout the year. is not far and has been described as possibly the most interesting of all England’s cathedrals, especially architecturally. It was founded it in 680. Saint Oswald then built another cathedral in 983, and established a monastery attached to it. Saint Wulfstan who rebuilt the cathedral in 1084, began the present building. During Anglo-Saxon times. Worcester is famous for its porcelain and there is The Worcester Porcelain Museum which houses the world’s largest collection of Worcester Porcelain. The ceramic collections, archives and records of factory production, form the primary resource for the study of Worcester porcelain and its history. Worcestershire is home to the famous Vale of Evesham, famous for its fruit and vegetable growing, just under 8 miles to the south of Evesham is the small village of Broadway often described as the ‘Jewel in The Crown’ of the Cotswolds, with is honey-coloured cotswold limestone buildings.